ARC 2015 race results VO65 Team Brunel has broken the ARC course record sailing from Las Palmas de Gran Canaria to Rodney Bay in the Caribbean Team Brunel, a Volvo Ocean race yacht has arrived in Saint Lucia in an elapse time of 8d 7h 39m 30s From the day ARC 2015 set sail from Las Palmas de Gran Canaria, Team Brunel has sprinted to the sun-soaked shores of Saint Lucia, with an average speed of 13.5kts and top wave surfing speeds of double that at times. 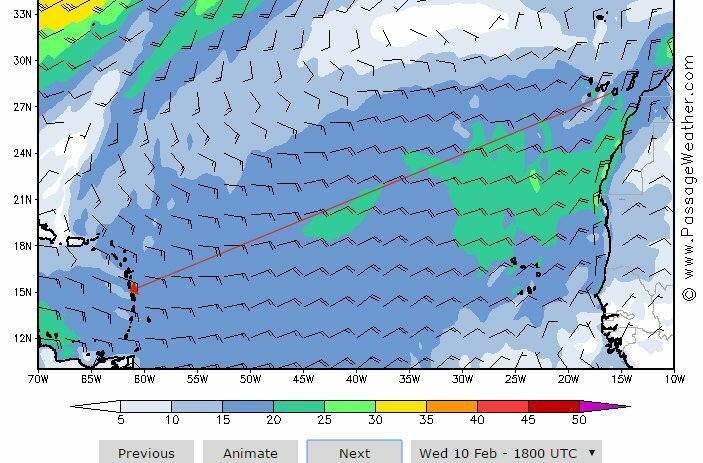 Persistent north easterly winds due to the well-established Azores High have allowed them to zig-zag the rhumb line route for much of their crossing. Interestingly, the total distance covered on their transatlantic route is greater than the two previous record holders at 3342 miles.